It should allow u to extract 3D models with simple formats. Means such games like Mafia2 or SleepingDogs not to be supported. So 0x123 is 291 decimal. Secondly you should be able to use a hex editor. If you don't have these two skills leave now, and come back as soon as you gained them. "the structures" to use hex2obj. o So here is a short tutorial on it's use. You don't need to know the technical terms - I just use them habitual. Simple 3D models consist of vertices and faces. the startaddress of the vertices and the one of the faceindices. Secondly we need the vertices count and the faceindices count. With a sequential model you only need to provide the above mentioned counts. With a blocked model you need to chose the vertex block size (FVF size), for example 32. If you don't understand anything you'll have to do a trial 'n error. Or you calculate the FVF size: each coordinate (x, y or z) consists of 4 bytes. So the above two blocks have a blocksize of 32 (8x4) each. It might be a little bit more difficult if there are DWORDs contained in the blocks. But anyway the most common blocksizes are 32, 40, 52. Sometimes 24, 44, 48 whatever. (for big endian the patterns are in reverse order of course). It's important to know that half floats use two bytes only. We leave the "LitE" button as it is (little endian data). The face indices are very easy to find since parts of the indices block look like a scrambled alphabet. To find the correct ending of the list is a very important step. 0x2B2E length DWord and string "Texture"
to get full use of the tutorial. hex2obj is NOT a one-click-solver tool - it was designed to help people to help themselves. If you don't have a basic understanding of 3D model formats you surely will get better results using a 3D ripper (for PC). 1) is the data compressed? Try offzip if your unsure (works for zip compressed data only) or search for a decompressing tool. 2) is it model data, texture data or animation data? 3) Before using hex2obj on a difficult format try out some of the dozens of simple samples on Xentax. 4) Then try out to get a point cloud  from your specific model as a first step. Look for continuous data sections with a size of 1 kB at least (0x400). Yeah, what the heck does that mean: "continuous data"? Hard to explain - in fact you'll need experience for that. If there's gaps with more than 10 zero bytes for example I'd say it's not continuous data. rather hard to find vertex data in short/Word format. The v0.21 H2O format changed slightly. So you can't use it with elder versions of the hex2obj. hex2obj (v0.21) can read elder H2O files and will convert them to v0.21 when saving them. (Be aware that there are various possible combinations of little/big endian, seq/VB, WORD/DW, noStrips/Strips and half floats/or not. Introduces "multi mesh" creation and the table button. v0.23d-f intermediate versions with bug, don't use! Last edited by shakotay2 on Thu Jul 26, 2018 1:43 am, edited 55 times in total. Q: how to find the start addresses of vertices and face indices (FIs)? Q: when I press the 'mesh' button it gives me an exception. A: A problem with the external mesh_viewer app. It expects a proper obj. But hex2obj will not always provide a proper one. It's some kind of trial 'n error tool, you know? Q: when I press the 'mesh' button nothing happens. "Reading test.obj... Error reading file [test.obj]. Q: how to calculate the vertex count of a (sub) mesh? it's using the max face index value as vertex count. That's the fundamental idea behind the project. Q: what about the '99' UVpos in VB mode? test.obj should contain same data as in seq mode. Q: why didn't you write this tool 5 years ago? Q: why the f... is Hex2obj's GUI messed up with Win7? A: happens, when you use a bigger font size in the Win7 GUI. Since this seems to be rare I won't upload a separate exe version. Last edited by shakotay2 on Fri Jan 20, 2017 2:41 pm, edited 18 times in total. updated exe (big endian untested) in start post. Normals are of subordinate meaning imho because you can autocreate them in nearly every 3D tool - as I wrote. texture coords (uvs) are covered. But your right: the models in this thread viewtopic.php?f=16&t=10841&p=89008#p89008 use a vertex block where the uv data is supposed to be half floats. From the values that looks pretty nice but isn't. This is some garbage but not an uv map. So finding the the uvs might drive you carzy. Automated analysation will always be limited. This is a tool for noobs to reduce the threshold. In the end there's no other choice than using your brain on analyzing of more complex models. Last edited by shakotay2 on Fri Nov 01, 2013 1:20 pm, edited 2 times in total. Sounds like a pretty cool tool to also test unknown formats! It's planned to introduce a param's file where to store the data of submeshes (vertex start addresses, vertex counts). 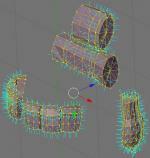 But this will not release you from searching for the submeshes manually before. Building the entire model from this param file's data should be possible. edit: version 0.1 (view start post) can handle half floats and triangle strips. Load/save of a H2O (param) file is possible. possible "65535 indices border" crossing (DWORD required). Although it's not really difficult, it has low priority for me. This is the reason: atm you'll have to search manually for every single submesh (SM) of the model. Often there are patterns by which you can identify the start addresses of the SMs. But you need to know these patterns which are different with every game. I can't think of a feature how to get them automatically. Once you know the pattern you can find the SMs by using your hex editors search function. You can search for 00 00 01 00 02 00 (00 00 00 01 00 02 for big endian) as an identifier for the start of WORD face indices lists but that does apply to few games only. Last edited by shakotay2 on Sat Nov 16, 2013 7:25 am, edited 1 time in total. the model and the pnzgren.h2o (param) file. You'll have to toggle the 'std' button to 'FFFF' (separator) bevor you click the 'mesh' button. well, we find another scrambled alphabet at 0x12620. The list ends at 0x1308D. So there are 0xA6E bytes or 2670/2= 1335 face indices. Entering these values and clicking 'go1' reveals a vertex count of 755 at the lower left listboxes' end. The start address of the vertices block is easily to be found: whole vertex list is 755*VBsize= 18120 dec. Subtracting 0x46C8 from 0x12260 gives 0xDF58 as the vertices start address. edit: for the vertices start of the body mesh you'll have to stick to 0x1BB88. Last edited by shakotay2 on Fri Nov 01, 2013 11:08 am, edited 1 time in total. version 0.2 is out. Can handle vertices/UV data as WORDs (unsigned 16 bit values). UV coords as words (looks like a divisor of 8000 being rather better than 65536). Last edited by shakotay2 on Mon Apr 21, 2014 7:40 am, edited 7 times in total. Another possibility is the "blocked" mode. Means you have a Vertex Block with a size of let's say 32 bytes. First block contains first vertex, first normal, first uv. 2nd block contains 2nd vertex, 2nd nomal, 2nd uv. Now we introduce the "mixed" mode where vertices and uvs don't share the same block. then the 2nd block and so on. After the last vertex block the uv blocks start. Then the 2nd uv block follows and so on. I call it "mixed" mode because you can look upon it as a blocked AND as a sequential mode, too. "Sequential" because there are all vertices, then all uvs. But vertices and uvs are in blocks, too. Not with each other but together with other data. NOT saved into the H2O file so far. Last edited by shakotay2 on Mon Jan 20, 2014 1:52 pm, edited 1 time in total. shakotay2, the links are dead Please re-upload your tools! I have the file and could upload it as last resort, but this really should be added to the Tools blog. save the mesh in two ways, first as ShortAll then as HF_UV (or HF_all). In the first obj file do a replacement of 'vt' by '#vt'. Then copy all vts (without the face indices) into the (ShortAll) obj. Last edited by shakotay2 on Sun Apr 24, 2016 1:00 pm, edited 3 times in total.